I had to show you guys my little witch. This picture was taken by a talented photographer named Mindy Edwards at Forever Making Memories Photography. Her button is over on my sidebar now, so go check her out and book a Christmas session with her. I promise I will be back to full blogging soon. We are still in boxes, eating way too much fast food, but gloriously happy to be in our new house. I have loads of projects and revamps to share as I get this new house decorated. Can't wait for y'all to see. In other news Alyson at New England Living highlighted a banner I made for her for the Thanksgiving holiday. There is also a beautiful portrait shown by the artist "Audrey Eclectic" of one of Alyson's ancestors who was tried as a witch in Salem, MA. Interesting stuff, check it out here. She looks sooooo adorable! Love it! Good luck on the unpacking. I love to move into a new home. It's so exciting! Happy unpacking...just in time for the holidays! What a cute witch you have! Moving into a new place is definitely exciting. She is SUCH a cutie, and I think she looks a lot like you! Can't wait to see house pics.!! Oh! 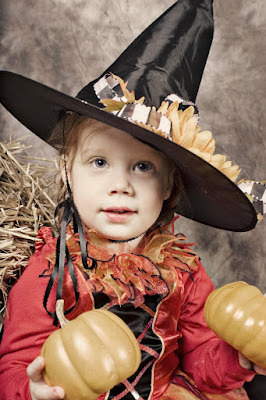 She is just THE most Gorgeous little witchie! And as for the old cemetery back there, well how lucky are you?! I always think it is a beautiful thin... you know?! If I were you I would scatter hundreds of mixed wildflower seeds all over the place, I'm sure "they" would appreciate it! Wow!!! She looks so adorable. Great post!! !